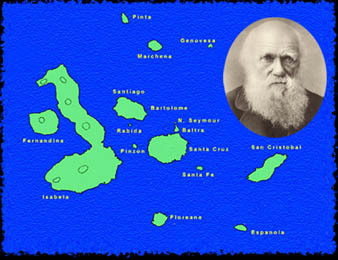 Mid-ocean islands like the Galapagos are formed from basalt, the most basic of all types of lava. Basalt has a very different chemical composition from the lavas that erupt from continental volcanoes, and is much more fluid. Consequently, as the lava flows build up to produce a volcanic cone, the island cones have a much shallower slope than those on the mainland. These shallow-sloped volcanoes are called shield volcanoes and in the Galapagos, they are often compared to over-turned soup bowls. Such shield volcanoes can clearly be seen in the younger western islands of Isabela and Fernandina. To the east, the volcanoes are lower and more eroded. Many volcanoes are topped by a caldera, a large circular depression derived from the original crater (sometimes this is subsequently filled in by new lava). During an eruption, the crater is fed from a magma chamber, but as activity dies down, the magma withdraws, leaving a large, open cavity. The ceiling periodically collapses, lowering the crater floor and widening the diameter. There was a major caldera collapse on Fernandina in June, 1968, when the floor dropped 300 meters! The largest caldera in the islands is that of Volcan Sierra Negra, Isabela, which is 7 by 10 km.